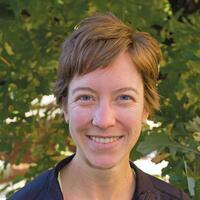 How do you know what to eat, and how much of it, when you're on the trail? 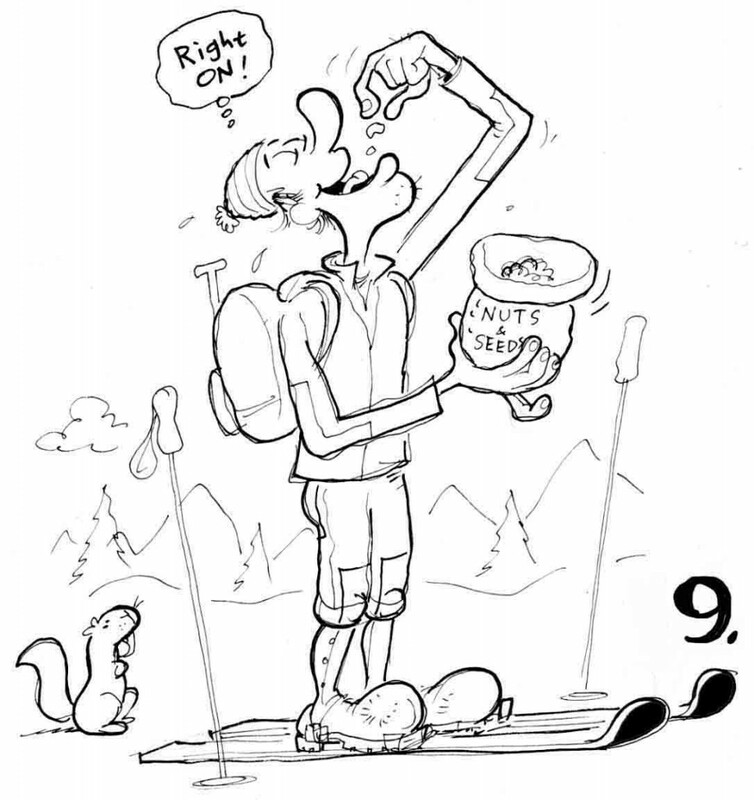 In the NOLS Cookery, you'll find a comprehensive guide to rationing and nutrition for both short and long expeditions. You'll also find a pile of delicious recipes for cooking gourmet food on the trail (see below for our burrito recipe!). 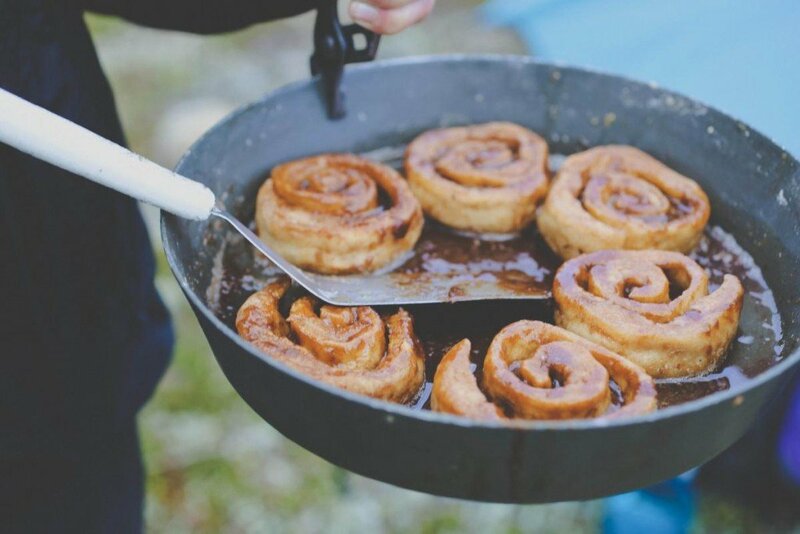 Preparing some fancy cinnamon rolls in a snow kitchen. Photo by Kyle Duba. One of the guidelines we use for food planning is the Backcountry Nutrition Pinnacle, basically a food pyramid for planning your meals. Exercise and water form the base of how you'll determine what you should be consuming with relation to how much activity you're doing. 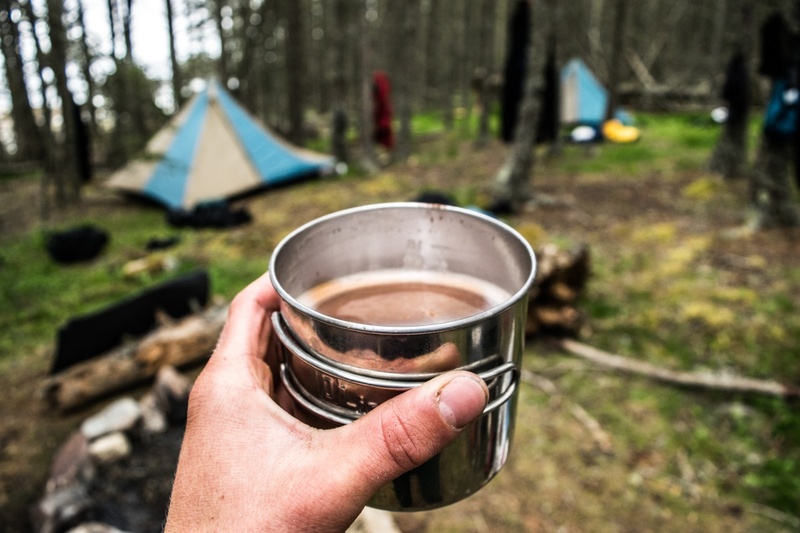 Water is the most important nutrient for both survival and optimal nutrition in the backcountry. Most days, we recommend drinking a 1/2 liter of water for every hour of moderately strenuous activity in moderately hot weather. You can also supplement plain water with other liquids like tea or drink mixes. Fluids containing electrolytes, such as sodium and chloride, can help in avoiding the rare but dangerous problems related to overhydration (see Hydration Tips for Camping). Carbohydrates are a great source of energy. Illustration by Mike Clelland from the 6th edition of the NOLS Cookery. Why this food group? Because it contains carbohydrates, which are most easily converted to energy and are your brain's preferred fuel source. They also contain B vitamins and iron, which are essential for energy production and a healthy nervous system; and vegetable proteins that combine with beans, nuts, and seeds to make the complete proteins necessary for building and repairing body cells. You need one to three servings at meals, and probably more on active days. A combination of whole and processed grains and starchy vegetables is an appropriate nutritional base for high levels of physical activity. These foods also tend to be quick and easy to prepare in the backcountry, which is perfect for the end of a long day. These foods are sources of carbohydrates, fiber, and vitamins and minerals. These foods also contain protein and healthy fats that you need as an energy source and a way to absorb some vitamins and minerals. You should eat around five to eight servings per day, though in the backcountry it's not always possible to get five servings of vegetables a day. These foods are sources of calcium and animal protein, and you only need one to two servings per day. Calcium is important for the structure of bones and teeth as well as muscle contraction. 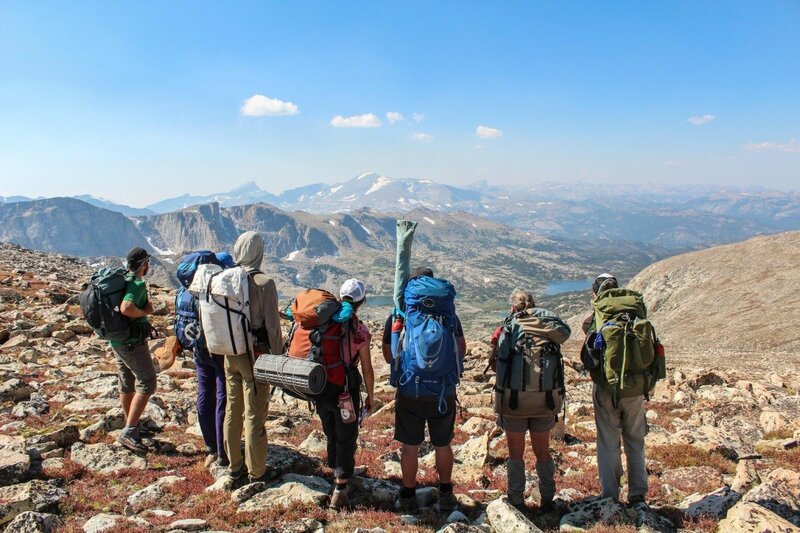 You may use animal proteins to supplement your backcountry ration, but you don't need them in large amounts, or even every day, to meet your nutritional needs. Eat nuts and seeds for protein and healthy fats. 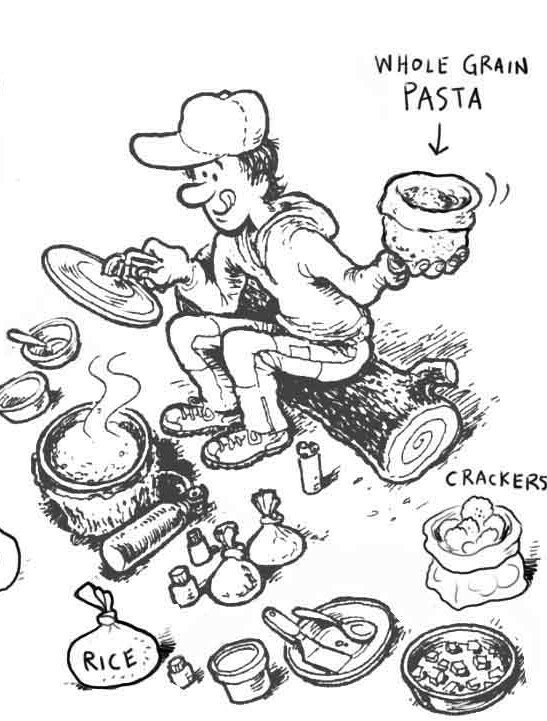 Illustration by Mike Clelland from the 6th edition of the NOLS Cookery. Use these sparingly. The types of fats that appear in this group come from sources like butter or summer sausage. They're different, however, than fats you'll find in other groups, such as the essential fats in fish and nuts, or the fats in dairy that are accompanied by other important nutrients (like B vitamins). 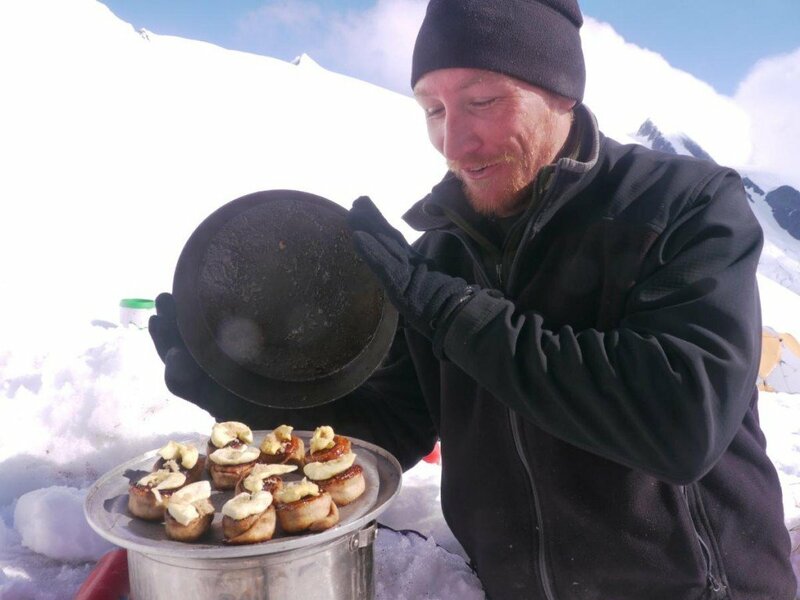 In the backcountry, we use the carbohydrates in sweet foods and the added calories from fat to support our high activity level, which is why we still need them in small portions. Fats and sweets also make food tastier, like adding brown sugar to your oatmeal. They can also be an important boost for your psychological health, which is equally as important as your physical health in getting you through the difficult days on the trail. Get recipes like this and more in the NOLS Cookery.